Many years ago, I built a website for a maker of hand drums. (I won’t link to his site, as I was never fully paid for it, but that’s another story.) 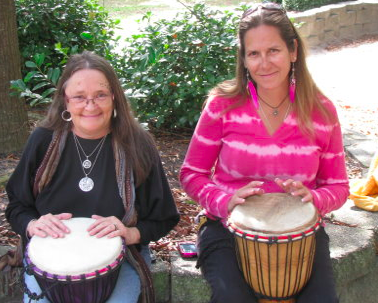 In the process I learned a lot about hand drums, and what all the variations of hand drums are properly called. In this picture, we see (from right to left) a red conga, a blue conga, a snare drum behind it, a blue floor tom (another “kit” drum), a red conga, a tan conga, and an improvised steel drum. No bongos. No, they’re djembes. You don’t know what you’re talking about. 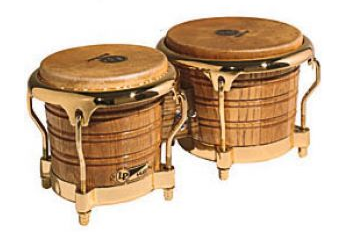 THIS is a set of bongos. Bongos are indoor drums. They are small… far too small to be heard in the midst of dozens of congas, djembes, floor toms, snares, and hundreds of dancing and howling revellers; so they are rare in large public gatherings of drummers. 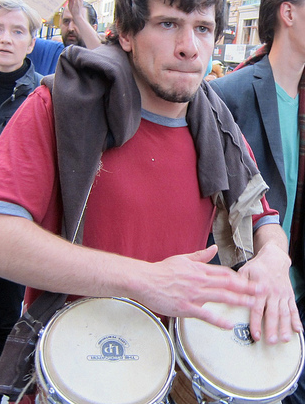 The only place I could find a picture of a bongo player at Occupy Wall Street was from somebody’s Flickr stream, and this guy looks like he’s working really hard to be heard above the ambient noise of downtown Manhattan. This entry was posted in Activism, Cool stuff. Bookmark the permalink.